President Trump announced today that we will guard the southern border with the military until the wall is finished being built. This is in response to a caravan of more than 1,500 illegal immigrants making their way through Mexico to get into the country through Baja, California or Texas. The Lone Star state has already mobilized the National Guard on the border and the President will be ordering they take up residence to cover the entire length of it. California will be ticked and will fight it, no doubt. “We’re going to be doing things militarily until we can have a wall and proper security.” Trump said. 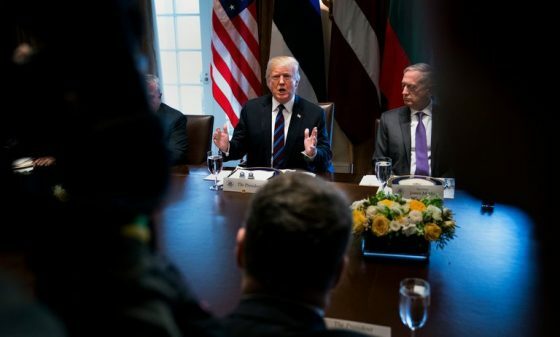 Trump’s comments came as he sat next to Secretary of Defense Jim Mattis, who was reportedly at the White House for discussions around immigration. However, a defense official who spoke on the condition of anonymity had no immediate details as to how many troops would be used, or what authorities they would have. Speaking later in the day, Trump indicated Mattis would be part of an afternoon meeting to figure out how to address the ”horrible, horrible, very unsafe laws” for the border with Mexico. The defense official noted one option could be similar to the 2006-2008 patrols U.S. military personnel conducted under Operation Jump Start. In that operation, President George W. Bush called for up to 6,000 National Guard members to secure parts of the border. Eventually 29,000 military personnel from all over the country were involved in the mission, which had a projected cost of around $1.2 billion. According to a memo obtained by Fox News and discussions with officials, one area where the Pentagon could contribute immediately is the Air Force’s Barry Goldwater live-fire range, which shares a 35-mile border with Mexico in southern Arizona. The Defense Department is already offering some support to the border, including U.S. Navy ships patrolling waters to seize drugs as well as missions involving over 100 personnel from U.S. military’s northern command — including eight planes and a drone — to help border patrol. About 80 percent of the caravan are Hondurans and Trump has already warned Mexico to not let then charge our border. Mexico acted as if they would deport them and then let them through as I understand it. President Trump wasted no time in making his announcement today in light of this development. “We are going to be guarding our border with our military. 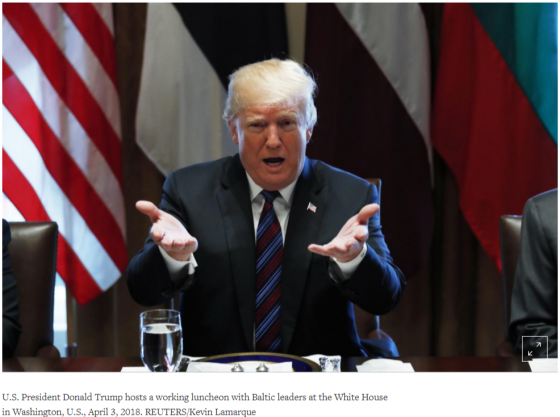 That’s a big step,” Trump told reporters at the White House. “We cannot have people flowing into our country illegally, disappearing, and by the way never showing up for court.” This has never been done before on this scale and it will be interesting to see how it plays out. Having military on our border is the right move here, but it’s a fine line to tread constitutionally. Trump attacked Mexico via tweets yesterday and today for allowing the group of immigrants to march towards the United States. He has already threatened to scuttle NAFTA over the incursion. I wish he would. That’s been a disastrous deal for Americans since the start. He also demanded Congress pass tougher immigration legislation and back his plan for a wall along the Mexican border. All steps in the right direction, unlike signing that monstrous omnibus bill that actually expanded the Catch and Release program. Trump has also announced that DACA is now dead and that it is the Democrats fault for playing obstructionist to a deal that he offered. Frankly, I’m glad it died. It should not be allowed. That would give amnesty to at least 1.8 illegal aliens who should not be here. “As ridiculous as it sounds, the laws of our country do not easily allow us to send those crossing our Southern Border back where they came from. A whole big wasted procedure must take place,” Trump tweeted Monday. He’s also seeking easier deportation measures to kick illegal aliens out. Again, I wholeheartedly support that. “Mexico & Canada have tough immigration laws, whereas ours are an Obama joke. ACT CONGRESS,” the President wrote. Mexican President Enrique Pena Nieto insisted that despite disagreements over illegal immigration, the NAFTA trade talks should go on. “We have been conducting serious negotiations,” he said, according to Agence France-Presse. I disagree. They should be cut off until this is resolved. Hold Mexico’s feet to the fire over this. Nieto expressed hope that “this spirit of positivity, mutual respect and cordiality” will continue. No such thing exists as long as they are invading our country. Pueblo Sin Fronteras, or People Without Borders, are the radicals who have organized the caravan of immigrants. They are doing so they claim to support immigrants who are fleeing El Salvador, Guatemala, Honduras and Nicaragua because of poverty and threats from criminal gangs. They started their trek on March 25th from the southern Mexican state of Chiapas. The Mexican government has had police stand down to allow them through. Heck, they are even feeding them. By Monday, the caravan had reached the southern Mexican state of Oaxaca. In a statement issued March 23rd, Pueblo sin Fronteras stated “Refugee Caravan 2018” is demanding that the U.S. and Mexico “respect our rights as refugees and our right to dignified work to be able to support our families.” They are demanding both Mexico and the U.S. “open the borders because we are as much citizens as the people of the countries where we are and/or travel.” No, they aren’t. The statement begins: “We are a group of people from different nations, religions, genders, gender expressions, and sexual orientations migrating and seeking refuge. We seek to to become one collective, supporting each other shoulder to shoulder and demonstrating that by uniting we can abolish borders.” They are an invading force, period and should be treated as such. They also issued a list of demands of Central American countries, including “an end to political corruption” and “an end to violence against women and the LGBTQIA community.” Good luck with that. This is the right thing to do and the Border Patrol should work with the military securing the border. It’s a matter of sovereignty, survival and national security. The big Caravan of People from Honduras, now coming across Mexico and heading to our “Weak Laws” Border, had better be stopped before it gets there. Cash cow NAFTA is in play, as is foreign aid to Honduras and the countries that allow this to happen. Congress MUST ACT NOW!